[…] What about when people who aren’t Jewish invoke the [Nazi] analogy? Once the Nazi holocaust became the cultural referent, then, if you wanted to touch a nerve regarding Palestinian suffering, you had to make the analogy with the Nazis, because that was the only thing that resonated for Jews. If you compared the Palestinians to Native Americans, nobody would give a darn. 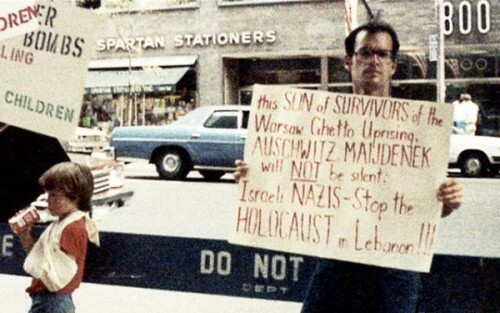 In 1982, when I and a handful of other Jews took to the streets of New York to protest Israel’s invasion of Lebanon (up to 18,000 Lebanese and Palestinians were killed, overwhelmingly civilians), I held a sign saying, ‘This son of survivors of the Warsaw Ghetto Uprising, Auschwitz, Maijdenek will not be silent: Israeli Nazis – Stop the Holocaust in Lebanon!’. (After my mother died, I found a picture of me holding that sign in a drawer among her keepsakes). I remember, as the cars drove past, one of the guys protesting with me kept saying, ‘hold the sign higher!’ (And I kept replying, ‘easy for you to say!’). If you invoked that analogy, it shook Jews, it jolted them enough, that at least you got their attention. I don’t think it’s necessary anymore, because Israel’s crimes against the Palestinians now have an integrity of their own. They no longer have to be juxtaposed to, or against, the Nazi holocaust. Today, the Nazi analogy is gratuitous and a distraction. No, it’s just a weak historical analogy – but, if coming from a Jew, a generous moral one. Last week, Ken Livingstone took to the airwaves to defend Naz Shah, but what he said wound up getting him suspended from the Labour party. His most incendiary remark contended that Hitler at one point supported Zionism. This was condemned as antisemitic, and Labour MP John Mann accused Livingstone of being a ‘Nazi apologist’. What do you make of these accusations? Livingstone maybe wasn’t precise enough, and lacked nuance. But he does know something about that dark chapter in history. It has been speculated that Hitler’s thinking on how to solve the ‘Jewish Question’ (as it was called back then) evolved, as circumstances changed and new possibilities opened up. Hitler wasn’t wholly hostile to the Zionist project at the outset. That’s why so many German Jews managed to survive after Hitler came to power by emigrating to Palestine. But, then, Hitler came to fear that a Jewish state might strengthen the hand of ‘international Jewry’, so he suspended contact with the Zionists. Later, Hitler perhaps contemplated a ‘territorial solution’ for the Jews. The Nazis considered many ‘resettlement’ schemes – the Jews wouldn’t have physically survived most of them in the long run – before they embarked on an outright exterminatory process. Livingstone is more or less accurate about this – or, as accurate as might be expected from a politician speaking off the cuff. He’s also accurate that a degree of ideological affinity existed between the Nazis and Zionists. On one critical question, which raged in the U.K. during the period when the Balfour Declaration (1917) was being cobbled together, antisemites and Zionists agreed: could a Jew be an Englishman? Ironically, in light of the current hysteria in the UK, the most vociferous and vehement opponents of the Balfour Declaration were not the Arabs, about whom almost nobody gave a darn, but the upper reaches of British Jewry. Eminent British Jews published open letters to newspapers like the Times opposing British backing for a Jewish home in Palestine. They understood such a declaration – and Zionism – as implying that a Jew belonged to a distinct nation, and that the Jewish nation should have its own separate state, which they feared would effectively disqualify Jews from bona fide membership in the British nation. What distinguished the Zionists from the liberal Jewish aristocracy was their point of departure: as Theodor Herzl put it at the beginning of The Jewish State, ‘the Jewish question is no more a social than a religious one . . . It is a national question’. Whereas the Anglo-Jewish aristocracy insisted Judaism was merely a religion, the Zionists were emphatic that the Jews constituted a nation. And on this – back then, salient – point, the Zionists and Nazis agreed. John Mann, when he accosted Livingstone in front of the cameras, asked rhetorically whether Livingstone had read Mein Kampf. If you do read Mein Kampf, which I suspect none of the interlocutors in this debate has done (I used to teach it, before the ‘Zionists’ drove me out of academia – joke! ), you see that Hitler is emphatic that Jews are not a religion, but a nation. He says that the big Jewish lie is that they claim to be a religion; whereas in fact, he says, they’re a race (at that time, ‘race’ was used interchangeably with ‘nation’). And on page 56 of the standard English edition of Mein Kampf, he says that the only Jews honest enough to acknowledge this reality are the Zionists. Now, to be clear, Hitler didn’t just think that Jews were a distinct race. He also thought that they were a Satanic race, and ultimately, that they were a Satanic race that had to be exterminated. Still, on the first, not trivial, premise, he and the Zionists were in agreement. Many of those involved in last year’s ‘antisemitism’ hysterics are also participants in the current campaign against Corbyn.